Attached to each box is a gift tag. You can personalise it yourself, or, for gifts being sent directly to the recipient, we can add a message of your choice (please email us with your order no. and message). A blend of English spring water, responsibly sourced black or white tea and artisan English vodka. 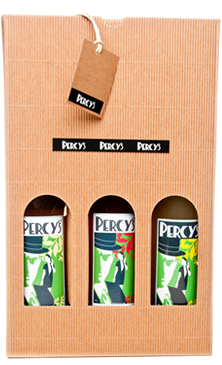 Percy’s is flavoured only with fresh fruit.